If you are already on their mailing list, then you will have already received an email with the information below from Health Means Wealth. Otherwise please register at http://www.healthmeanswealth.co.uk/index.php?pr=Newsletter to get all such emails in future. There are no Sunnah days for cupping (hijama) in this month of Jumada Ath-Thaani as the 17th, 19th and 21st of Jumada Ath-Thaani do not correspond with a Monday, Tuesday or Thursday. Please kindly note that these dates are based on the new, lunar month according to the sighting of the new moon by the naked eye, as cupping (hijama) is a form of worship. These dates may sometimes vary from the calculated, lunar dates. Abu Hurairah (may Allaah be pleased with him) reported that the Messenger (Sallallaahu Álayhi Wasallam) said, “Whoever performs cupping (hijama) on the 17th, 19th or 21st day (of the Islamic, lunar month) then it is a cure for every disease.” [Saheeh Sunan abi Dawud (3861)]. Ibn Umar (may Allaah be pleased with him) reported that the Messenger (Sallallaahu Álayhi Wasallam) said, “Cupping (hijama) on an empty stomach* is best. It increases the intellect and improves the memory. It improves the memory of the one memorising. So whoever is going to be cupped then on a Thursday in the name of Allaah. Keep away from being cupped on a Friday, Saturday and Sunday. Be cupped on a Monday or Tuesday. Do not be cupped on a Wednesday because it is the day that Ayoub was befallen with the trial. You will not find leprosy except (by being cupped) on Wednesday or Wednesday night.” [Saheeh Sunan ibn Maajah (3488)]. * ‘alaa ar-reeq in arabic means to fast until after being treated with cupping. Once the treatment of cupping has been completed, one may eat and drink. As for the Islamic day and night, the night enters before the day. So at sunset on Tuesday, Wednesday night comes in. Cupping (hijama) is best performed during the daytime between the athaan of fajr and the athaan of maghrib because yawm in arabic means daytime. The Sunnah days for cupping (hijama) every month are when the 17th or 19th or 21st of the lunar month coincide with a Monday, Tuesday or Thursday. These are the best and most beneficial days for cupping (hijama). If one is not able to be cupped on 17th, 19th or 21st (coinciding with Monday, Tuesday or Thursday) then any Monday, Tuesday or Thursday of the month. Jaabir ibn Abdullah y reported Umm Salama (may Allah be pleased with her) asked permission from the Messenger r to be treated with cupping (hijama). So the Messenger r ordered Abu Teeba t to cup her. Jaabir ibn Abdullah y said, ” I think he r said that Abu Teeba t is her brother through breastfeeding or a young boy who didn’t reach puberty”. [Saheeh Muslim (5708), abu Dawud (4102), Saheeh ibn Maajah (3480)]. 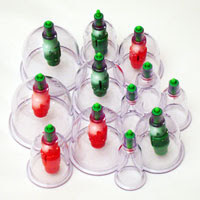 Dry and massage cupping may be performed at any time. We pray you find this information helpful. Please do not hesitate to contact us if you have any queries, comments or feedback. JazakAllah khair for your support. Please add us to your ‘contacts’ so that our newsletters are not received as spam. Our thanks to Health Means Wealth, from Surrey, England for sharing the above post. If you have any questions or want to leave some feedback for them, then please do so via a comment* below.